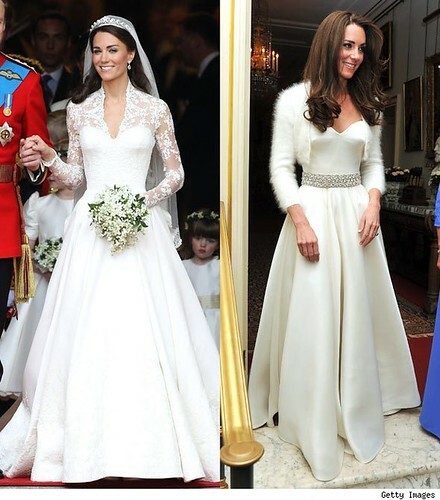 Mia Thermopolis » Blog Archive » A Royal Wedding! I haven’t had a single chance to post about the royal wedding, thanks to the fact that the minute I got home from England, it was time to start studying for finals (how can I be getting a D in Women’s Studies? I’m a woman! Why won’t that teaching assistant cut me some slack? I swear it’s anti-royalism), not to mention that it was my birthday on May 1. And if any of you were around a television on May 1, I’m sure you noticed what happened on May 1. I’m pleased that justice has been served, and all of that. It’s just that it’s a bit jarring to be enjoying your birthday and suddenly, everyone is jumping around excited about someone being shot in the head, even if he deserved to be. Plus, my suitemate Carla was quite wrong that it meant we would not have to turn in any papers the next day. Because we still had to. And that is why my D in Women’s Studies is now more like a D minus. Never mind that everyone else in the entire world is referring to the royal wedding of Prince William and Kate Middleton, aka the Duke and Duchess of Cambridge (their new titles), as the classiest and most lovely royal wedding ever. Of course, the only reason it was as lovely as it ended up being is because Grandmére ended up being kept far away from it (due to a "migraine"), which you probably already know if you’ve read anything about it. Although really it was thanks to her hijinks at the Mandarin Oriental the night before (why did they let her drink so much in the first place? You would think by now everyone would know how she gets around too many good looking Arab sheiks after a half dozen Sidecars). The Royal Genovian Publicity Office did their best to keep everything about Grandmére and her insanity whilst we were in London out of the press. Good thing about the Syrian ambassador, because most people were concentrating on that (and Princess Beatrice’s hat. No one in my family had anything to do with that, at least. In fact, Paolo tried to warn her, but Bea wouldn’t listen. Lilly says she thinks Bea was trying to make an ironic statement of protest since her mother wasn’t on the guest list. In which case, she succeeded handily). Thank goodness Michael was the one I finally chose to be my "plus one" (that’s what they call the person you, the invited guest, bring along as your date). It was a very difficult choice for me because of course Tina Hakim Baba wanted so badly to come. But so did everyone else I know, even Lilly. But honestly, even before Grandmére’s bad behavior at the Mandarin, I knew I’d need someone who could remain calm in a sea of chaos (Michael); upon whom I could lean for both emotional and physical support in a time of crisis (Michael); and who also had a lot of pockets in case I needed to smuggle in lip balm or Kleenex in case of an emergency (Michael) because they wouldn’t allow any of the female guests to bring purses (for security reasons) into the wedding ceremony. Only Queen Elizabeth gets to carry a purse. I have found out what she keeps in it, too: Mars bars. Really. She showed me. She says she needs them for protein when her spirits flag. This is genius. I will be keeping Mars bars in my purse when I am regent as well. And even though I knew the last thing Michael wanted to do last week was fly to London on the Royal Genovian Jet with my dad and grandma and go to a royal wedding, he very kindly never gave so much as a hint as to how incredibly bored he was. I only caught him playing Halo with my bodyguard Lars twice. And he didn’t say a word about the food (which really was very bad, but then, it’s hard to cater to that many people, especially when they have such diverse dietary restrictions. I mean, the Dalai Lama alone . . . what were they supposed to do? No wonder QE keeps the Mars bars around). Naturally I couldn’t live blog the event like I promised, because they wouldn’t allow us to have any sort of electronic devices in the actual abbey or at any of the parties afterwards, again for security reasons, which I quite understood, because it would have been extremely demoralizing to the public if someone had put an explosive device under a manhole or something, and then set it off just as one of those shuttle buses carrying all us royals rolled over it, and we were blown to smithereens in front of nearly three billion viewers. And before the wedding, at the hotel, we were in lockdown mode, due to all the press gathered outside, trying to snap pics of us, and get me to tell them what Kate’s dress(es) looked like. The press was relentless from the moment we got off the Royal Genovian Jet! Everyone wanted me to "comment" on how Kate must have been feeling right before the big event. How was I supposed to know how Kate was feeling? I’ve never gotten married in front of three billion people! Or any people at all. If I were Kate, I’d have been throwing up in a toilet somewhere from all the stress, and my mom would have to have been holding my hair back (if I had Kate’s hair, not my own hair, which is still shaped a yield sign and only chin length, so no one would have to hold it back if I were throwing up). The Royal Genovian Publicity Office tried to tell the press I’d already made two statements (wrongly attributed to Meg Cabot, as usual, but then, what else is new), but they wouldn’t listen. They even gave them URLs (I thought this one, to Parade Magazine, basically the most widely read news magazine in America, was the most thoughtful and lovely, because it’s true Princess Diana was really the first royal to publicly touch someone with AIDS, at a time when NO ONE else would do so). And this statement–Tips To Kate– was just for fun (especially since there’s an opportunity to win free books if you submit your own tips), but I did mean every word of what I said. Kate should NOT Google herself, some people are just so mean, and really needlessly so. It’s like you can never be good enough for some people, no matter how hard you try, even if all you’re trying to do is give people happiness and joy in their lives. Some people just seem to thrive on negativity and are just never going to have anything nice to say, so why waste one minute of your time on them at all? Unless of course that person happens to be your grandmother. Then you can’t avoid her, unfortunately. Of course, they didn’t really go anywhere (just drove back round to the party where we were all waiting). He didn’t mean the rest of the ceremony. He meant the car. b) that is very romantic. And I certainly hope Michael isn’t getting any ideas about eloping because with the whole Women’s Studies thing (HOW? HOW CAN I BE GETTING A D? I understand about the missed paper, but how can I get be getting such a bad grade in a subject on which I should be an expert? I am a feminist and so are all my friends and my mom. I am sure this has something to do with my being a princess. But I can’t help this. I was born this way. What am I supposed to do, reject the throne? But I want to use my throne to HELP WOMEN. ARGH!!! ), this whole wanted-criminals-getting-shot-on-my- birthday thing, and my grandmother being uninvited to royal weddings along with the ambassador to Syria, I don’t know how much more stress I can take. But it was lovely, wasn’t it? I can only dream that one day, I will have a wedding half as nice, even if it is an elopment in Michael’s parents PT Cruiser (oh, dear GOD, no) . . . .